1)Round 1: In this round MCQ (verbal/non verbal)were given to the participants and they were given 10 mins to complete it.selection was done based on maximum correct answers.The students selected were qualified for the next round. 2)Round 2:The students qualified in Ist round were given Crossword puzzles to solve. They are given 15 mins to finish the puzzle. Selection were done on the basis of maximum correct answers. The students selected were qualified for the final round. 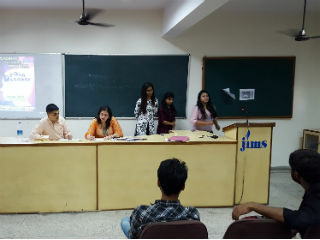 3)Round 3:This was the final round in which Extempore was conducted where the students were given on the spot topics and they were asked to speak on the topic for 5 mins Selection as based on their communication skills, knowledge on topic & self confidence. The winners were given cash prizes.